Regular cleanings are generally recommended every six months for most patients for optimal oral health. Cleanings should be performed in order to prevent plaque, calculus and stain buildup. Plaque left untreated can lead to unhealthy gums and tooth decay. The experienced hygienists or dentists at our office will make your regular cleanings as comfortable as possible. 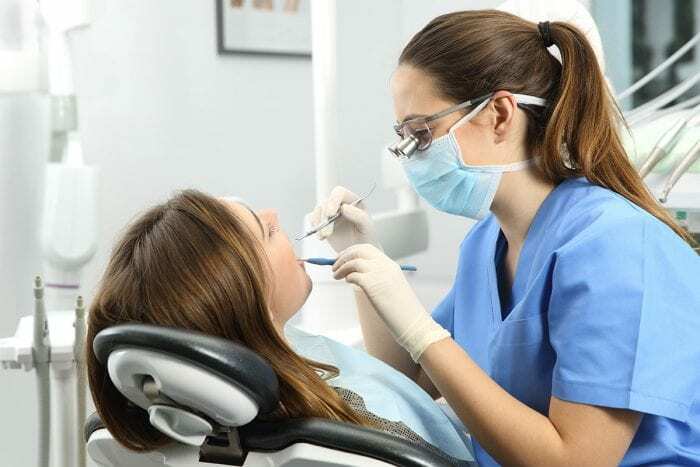 Thorough exams, including an evaluation of the patient’s dental and medical health status, as well as an oral cancer screening and oral hygiene instructions are also completed during each cleaning. Fillings are done to remove decay and replace lost tooth structure by using materials such as metal, alloy, composite or porcelain. If caught early enough, cavities can be treated easily and painlessly. If not treated, decay can lead to tooth pain and infection, and the tooth may need root canal treatment or an extraction. A filling helps prevent further decay by closing off any cracks or spaces where bacteria can enter. The two most common restorations offered at our office are amalgam, which is referred to as a silver filling, and composite, which is referred to as a tooth-colored filling. Our dentists will discuss with you what material is recommended in each specific case. Our office offers many types of crowns and bridges. 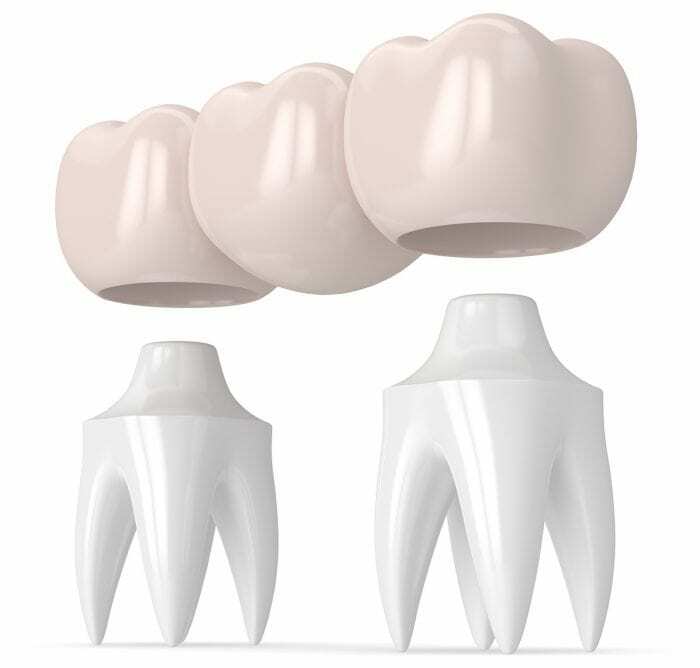 Crowns are a covering that is permanently cemented to a tooth to protect it. Crowns may be needed if too little tooth remains after a cavity or fracture of a tooth. Crowns can be made from gold, alloy, porcelain or other ceramic materials. Porcelain and other ceramic materials are used to create a more aesthetic appearance and can be used on nearly any tooth. Most crowns cover the entire tooth, but it is still possible to get a cavity on a tooth underneath the crown. Teeth with crowns still need daily brushing, flossing and regular professional cleanings. A bridge is similar to a crown, but a bridge is made to replace a missing tooth or teeth. When a tooth is missing, a crown is made to cover each tooth on either side of the missing tooth space. 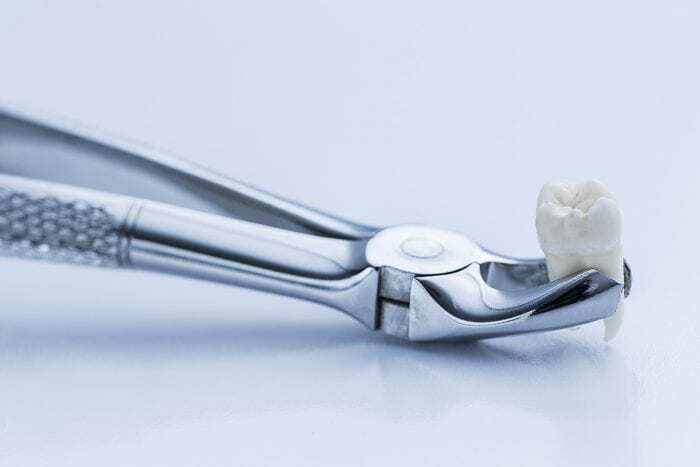 An artificial tooth is then created to replace the missing tooth and is securely connected to the the crowns on either side. A bridge is permanently cemented, much like a crown. Bridges also come in gold, porcelain or ceramic. They must be cleaned regularly and also require special flossing techniques to clean underneath them. 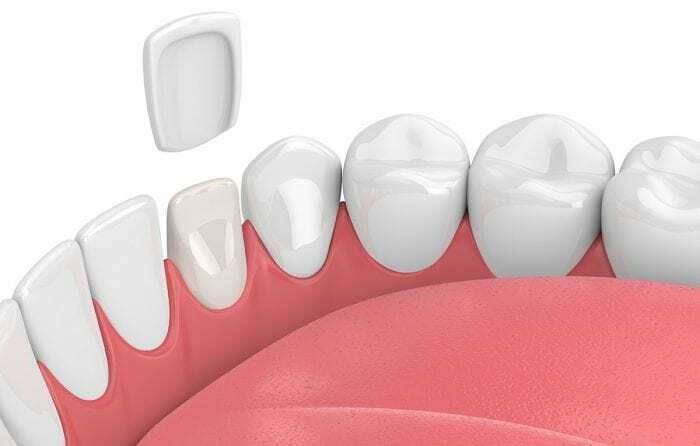 Bonding involves adhering tooth-colored composite resin material to the front of the tooth. This is often done to repair damage to the tooth caused by decay, to alter the alignment of the tooth, close gaps between the teeth, or for cosmetic purposes. Veneers are a thin covering that are placed over the front surface of a tooth, usually to restore discolored, damaged, or misaligned teeth. The process usually involves two appointments because the veneers will be fabricated at a dental laboratory. At the first appointment the teeth are prepared, impressions are made, and the teeth are given a temporary covering. Approximately two weeks later, the permanent veneers are bonded to the teeth. The laboratory fabricated veneers are usually made using porcelain or pressed ceramic, and are very aesthetic. The loss of just one tooth can lead to a number of oral health problems. If you have a missing tooth that’s not replaced, surrounding teeth can drift out of place, resulting in misaligned teeth and an altered dental bite. Dental implants are a predictable, reliable solution to replacing missing teeth. Dental implants have become much more commonly used in dentistry today. A dental implant is a titanium post placed into the jawbone. 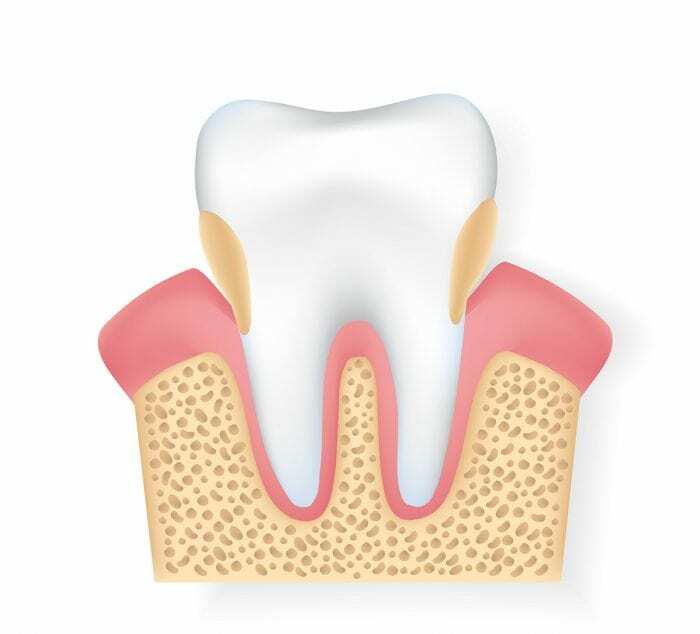 After the bone heals into the post, a replacement tooth can be placed on it. Implants can be used to replace a single tooth or multiple teeth. Implants can also be used to provide more support to a denture that moves too much during use. 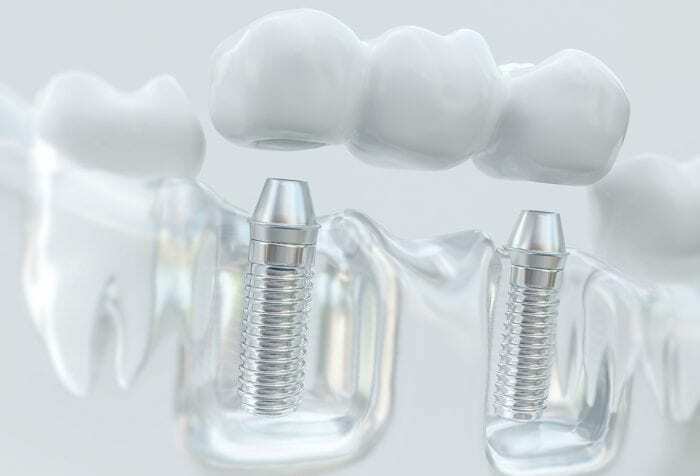 Our office will coordinate with a specialist for the implant to be placed and, after healing, a tooth replacement is made and placed in our office. There are many types of implants used and an examination will determine which type may be best for you. One of the biggest advantages implants have to offer over bridge work is that implants do not utilize the surrounding teeth for support. Extraction, or removal, of a tooth is required when a cavity has become too large and a root canal is not possible. Extraction may also be required when a tooth is fractured, broken or damaged or has severe periodontal disease. Baby teeth may need to be extracted if they are interfering with the normal progression of adult tooth growth. After extraction of a tooth, replacement may be possible with dentures, bridges, or dental implants. Baby teeth are typically not replaced but special devices are sometimes necessary to maintain proper space for the adult teeth to grow. Extraction of wisdom teeth may also be required in certain cases. Wisdom teeth are often extracted in late teenage years because the procedure is generally less risky and these patients heal much faster compared to adults. Referral to an oral surgeon is generally needed for extraction of wisdom teeth. Full dentures and partial dentures are made to replace multiple missing teeth. There are different types of partial dentures and our office can help with deciding which is best for you. Full, or complete, dentures are made to replace all of the teeth. Dentures, whether partial or full, are removable and must be taken out regularly and cleaned at home. It generally takes several appointments to make partial and full dentures. Full dentures often require a significant change in the way you eat and speak. In particular, full dentures that replace the lower teeth tend to move during use and can be frustrating to use. If dentures are not stable, dental implants may be used in conjunction with dentures to help keep them in place. Periodontal disease occurs when the bone that holds the teeth shrink, causing the teeth to become mobile and possibly lost over time. The gums and bone around the teeth (periodontium) form the foundation for one’s teeth, and when the periodontium is not healthy, it jeopardizes the teeth. Signs of periodontal disease include: red, easily bleeding gums, bad breath, gums that are pulled away from the teeth, and loose teeth. Periodontal disease has many causes, including lack of regular cleanings and genetic factors. While periodontal disease is not curable, the goal of periodontal treatment is to slow down the disease and bone loss as much as possible. Periodontal treatment usually involves a deep cleaning and root planing, often done under local anesthetic, with either our dentist or hygienist as well as the placement of local antibiotic agents. After the initial round of deep cleanings, a recommended schedule for future cleanings will be determined on an individualized basis. Referral to a specialist called a periodontist may be needed to manage more severe cases of periodontal disease. Stains accumulate on the teeth with certain foods or drinks such as coffee, dark colored soda, and red wine. Stains also result from the use of tobacco products. 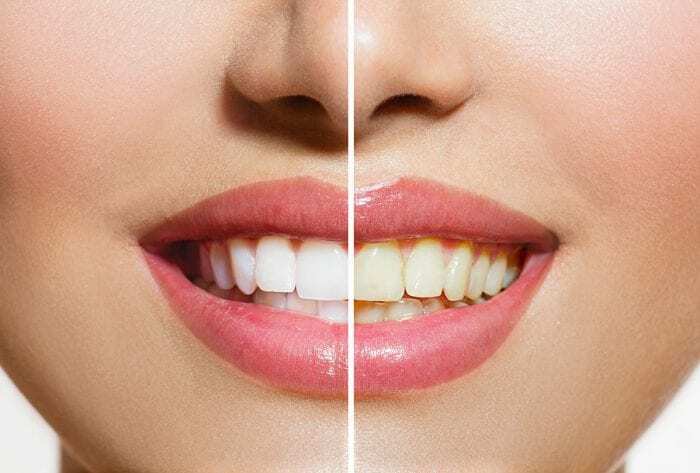 Our office can make custom bleaching trays that are made to fit specifically over your teeth. Bleach gel is placed in the trays and then worn over the teeth for a certain period of time. Different concentrations of bleach are offered, depending on the desired results and sensitivity of your teeth. Our office also offers a pre-filled, disposable tray whitening system. This is a great alternative for patients looking for convenient, ready-to-go whitening that is more effective than over-the-counter products, yet is less concentrated than custom tray bleaching and therefore will cause less sensitivity. We’re proud of the special way our team interacts with our young patients. Patient education is an essential part of what we do, and we’ll work with your child to help them understand how important it is to practice good oral hygiene at home. Your child’s first “regular” dental visit should be around their second birthday, unless you have any questions or concerns prior to that time. The first dental visit is usually short and involves very little treatment. We may ask you to sit in the dental chair and hold your child during the examination.You may also be asked to wait in the reception area during part of the visit so that a relationship can be built between your child and your dentist. 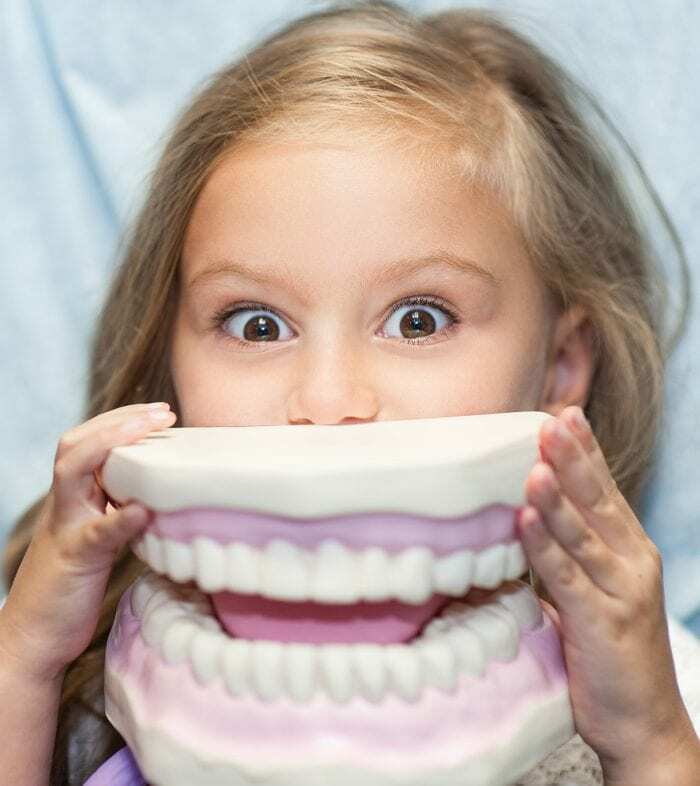 We will gently examine your child’s teeth and gums. X-rays may be taken to check for decay and the progress of your child’s permanent teeth under the gums. We may clean your child’s teeth and apply topical fluoride to help protect the teeth against decay. Most important of all, we will review with you how to clean and care for your child’s teeth. Sealants are a common preventive procedure that are often recommended for children’s adult molars, usually around the age of 6-12 years and are applied to the narrow grooves on a tooth that cannot be adequately cleaned by brushing to prevent decay.